Do not hesitate to contact us for any question you cannot find the answer in our F.A.Q. section. Our team will be happy to inform you directly. Can I pay my tuition fees and accommodation costs on arrival ? Tuition fees must be paid 4 weeks before the starting date of the course. If there is a problem with the secure payment on the website, you may pay when you arrive with the school's permission. Am I able to change my programme either before or after I arrive ? Yes, you can do this before you arrive. When you have arrived this may not be possible, but do ask the staff. What should I do if I find the level of my class too high or too low ? Have a chat with the director of studies who will discuss the best solution with you and your teacher. May I add extra classes to my programme ? Yes, of course! Just talk to the director of studies and we will try our best to fit you into the class you wish to take. If I am taking the DELF exam, how do I get to the examination centre in Sophia Antipolis ? Take the bus to Sophia, this takes around 40 minutes from Nice. The centre is just a walk away from the bus stop .. A map and all the explanations you need will be given to you in advance. If I am absent for the DELF exam or for health reasons will I be reimbursed ? No, if you are away to take the DELF exam or for any other reason , the lessons that you have missed will not be refunded. Will I be in a class with other students the same age as me? - What do I do if they are all much older or younger than me ? Most of our students are between the ages of 17 and 40 but we do have older students. All students are here with the same objective, to improve their French, so whatever their age, you are sure to find something to talk about. Will I be given all the learning materials that I need ? Beginner and elementary students can borrow a book for 20 € which will be handed back to them when leaving the school if they don't keep the book. Other levels will be given handouts as required. Do all the lessons take place at the IH premises ? Our premises are very large with up to 10 classrooms. We may have to rent other premises in the summer but this is rare. an I stay after classes to do extra work ? Yes, there is a self study room; you may borrow extra resources without taking them home until 5 pm. What happens if I leave before the end of my course? Will I be reimbursed ? No, only if there are extenuating circumstances and at the director’s discretion will you be reimbursed. I need more specific French for business etc… will this be possible ? This is possible depending on your course. General French is studied in the morning classes, but if you have chosen private or combined classes then this will allow specific subjects to be studied. If I rent a studio, what are the regulations and what deposit is required ? A deposit of 400 € is required, which must be paid straight to the landlord on arrival. 100% of this will be returned on your departure, unless damage to the property has occurred. Are towels and bedding provided in all accommodation ? Host Families: all bedding is provided and usually towels. Residences and studios: bedding is provided, but towels are not always. You should bring your own beach towels with you. How long will it take to get to my host family from the school ? All host families are carefully chosen. 50% live in central Nice, the others are rarely more than 20 minutes away by bus or tram. In fact most students walk to school but situations can vary when the school is full, particularly in the summer. May I extend my stay ? Yes, ask us first and don’t leave it too late. If the family is already booked up, you may have to change families. What happens if I don’t like my host family ? See the accommodation officer who will sort out the issue, and find a replacement family. Please note that in the summer time, families can be very hard to find. May I ask the host family to take me to the airport when I depart ? It is easier for you to ask for this service when the course is booked, but it may be possible to arrange this personally with the family. If arranged directly with family, payment must also be made directly. Who will pick me up from the airport if I ask for a transfer ? If you choose to stay in a family, normally it is the family who will come and pick you up. It might be the shuttle driver when the family cannot come to pick you up from the airport. If I rent a studio, can you organise airport transfers ? Yes, we can organize shuttle transfers for the students who are staying in a studio,a residence or a hotel. It costs 35 € one way. If I don’t arrange my transfer through the school, what other way is there to get to my accommodation ? There are taxis at the airport that can take you to your accommodation; this costs around 30-35 €. There are also 2 buses that run from the airport to the centre of town, the 98, which goes to the Gare Routière (bus station), and 99, which goes to the Gare SNCF (train station). These will cost you 6 €. A single journey on the tram or bus usually costs 1,50 €; day passes can be bought for 5 €. What happens on the first day at IH? – Will I be tested ? Yes, on the first day you need to arrive at the school at 9 am, and like all new students you will be tested to ensure you are placed in the correct group for your ability. Lessons will start after the test. What happens if the first day of school is a bank holiday ? You will arrive with the family on the Sunday, then inquire with the school whether something has been organised for the Monday, such as a excursion. What happens if there are bank holidays during my stay ? If there is just one bank holiday, this will neither be refunded nor rearranged. If there are two in the first four weeks of your stay, one will either be refunded or rearranged. If you are staying for a long period of time, the tariff already takes lessons missed due to bank holidays into account. What happens if I don’t find the person meeting me at the airport ? Every student is given the family's phone number and the Director 's phone number. The Director will sort out the problem. However, this is a very rare occurrence. Call Mr. Rubinstein, +33 (0)4 93 80 07 59 or +33(0)6 09 50 39 43. If I have a problem with the family, the food or the cleanliness, what should I do ? We take all aspects of your stay seriously and if you have a problem with your family, that you don’t feel you are able to sort out yourself, just talk to the accommodation officer and she will do everything she can to improve the situation. What should I do if I lose things or they are stolen? You should report this to the police as soon as possible in order to get a reference number, which you will require if you want to claim on your insurance. If any credit cards etc are stolen, make sure you contact your bank immediately and get them to cancel them. In France you are required to carry ID with you at all times; it is better to take a photocopy of this and leave the original at home. This can save you a lot of trouble, especially if a passport is the only form of ID you have. What happens if I get sick or have health problems whilst in France ? The school is associated with a doctor, ask the secretary and she can make an appointment for you. For more serious problems, there are several very good hospitals in Nice, where you can receive medical attention. What are opening hours of the school ? The school is open from 8:30 am to 5:00 pm, allowing plenty of time for those extra studies and use of the internet. Each student should ensure that they have travel insurance for their trip ( EU citizens may apply for a European Health Insurance Card). If you rent a studio then adequate insurance for this is required. It is best to come with some cash, and a credit card in case of emergencies. You should also bring pens and a notebook to your classes, but these can be bought when you arrive if you prefer. Clothes - This obviously depends on the time of year. The weather is mild most of the year, but you should bring jumpers, coat and umbrella in the winter months (Nov – Feb). It gets hot in July and August, so sunglasses and sun block are necessary. Can I get a student card ? Vous pouvez demander au secrétariat de vous fournir une carte d'étudiant. Il faudra alors nous donner une photo. Avec cette carte vous aurez des réductions pour les transports, bus et tramway et aussi des réduIf you ask the staff ,they can provide a student card that will get you special rates for the bus and tram and also for other attractions in France. Is it okay to drink the tap water, or should I buy bottled water ? Yes, the tap water is fine to drink, however many people buy bottled water as they prefer the taste. Where should I have lunch ? There are many restaurants and cafés around the school. 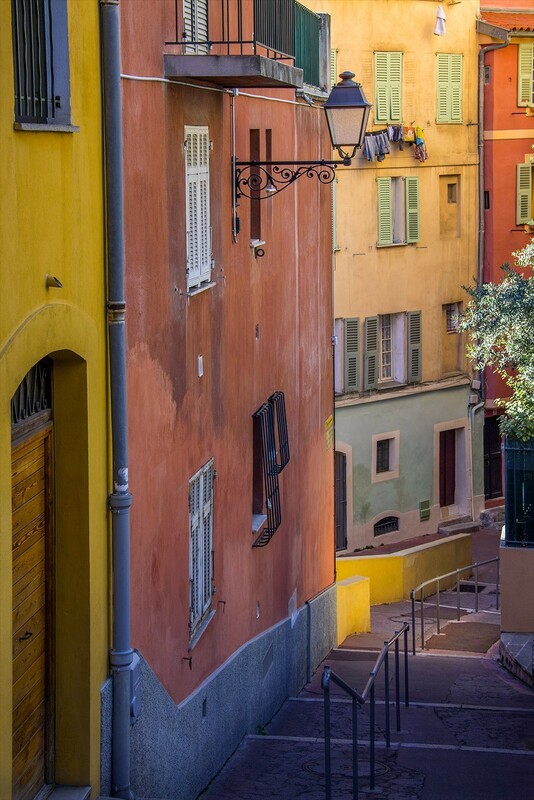 IH Nice is just 6 minutes walking distance from the centre but restaurants around the school are good and cheap. You can also buy a sandwich or baguette from one of the local bakeries. Can I use internet at the school and/or connect to the internet using my laptop ? Yes, there are computers in the student room, that can be used during breaks or after lessons. We also have a free WiFi connection in the school. I am happy with the school and I would like to study a different language in another IH school; can I enrol through you ? Yes, see the sales manager who will be able to get in touch with the relevant school and organise your enrolment. How many social activities are organised each week ? This depends on the time of year. In the busy summer months there are a minimum of 2 organised activities per week sometimes 3 ; this is reduced to 1 in the winter months.